Want to know what can make UNC-Chapel Hill and Duke University students work together for a common cause that serves the Triangle? Well, BounceBack Kids can! This nonprofit has been helping chronically ill children and their families since 2003. Carolina Woman caught up with Lisa Brachman, one of BounceBack Kids’ co-chairs, to see how Triangle women are making a difference. Q Describe your organization in one sentence. A We help children who are chronically ill by providing fun activities and support for them and their families. Q	What’s your group's mission? A To enhance the lives of children with serious medical conditions and their families by offering free, year-round social, athletic and recreational activities, as well as support services, in a caring and safe environment. Q	How is that accomplished? 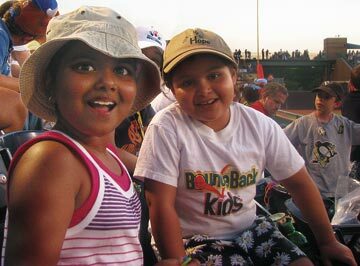 A Each month we offer recreational, social and athletic activities to BounceBack Kids. We try to provide support in non-traditional ways, such as loaning children iPads for hospital stays and having yard work or house cleaning done while children are getting treatment. Q What's the group's history? A BounceBack Kids began by offering basketball-skills sessions to four girls with brain tumors. Shortly after the program started, the founders realized that offering other forms of fitness and fun would benefit the kids, their siblings and their parents. Other organizations began offering tickets to events, such as hockey games, and the organizers realized the value of these kids socializing together. The program expanded to include children with other types of cancer and chronic illnesses. Q What are your goals for 2011? A We hope to offer twice-a-month activities for our families, expand our resource guide and create a family-friendly fundraiser. A We would love for Triangle women to volunteer and get involved in our programming and fundraising efforts. Depending on the woman’s interest, she could volunteer at an activity, help us with publicity materials or plan an event for us. Q What's happening in the next few months? A These next few months are busy. In February, students from Duke and Carolina, along with the broader community, will play a two-day basketball marathon to benefit BounceBack Kids. We’ll also offer our regularly scheduled activities, including basketball and an outing to a Duke women’s basketball game. We will continue selling our new cookbook, “The BounceBack Kids Cookbook: A Recipe Collection by Families, Friends and Famous Chefs.” And in March, we’ll host an open house where potential participants and their families, potential referral partners and potential volunteers can learn about our program while observing or participating in our basketball and fitness sessions. Keep an eye out for special recipes from the group’s new cookbook in a spring issue of Carolina Woman. Jennifer Tilman, of Apex, released her book “Grooming Tales: From A to Z.” The memoir, published by Tate Publishing, recounts her experiences as a dog groomer. Alice Osborn, a manuscript editor and freelance writer from Raleigh, will release her book of poetry, “Unfinished Projects,” this month. Main Street Rag Publishing will publish the collection. Tinka Jordy announced the opening of ENO Gallery, an art center in Hillsborough, where she is the co-owner. Suzy Barile, an author and professor of English and journalism at Wake Technical Community College in Raleigh, received a Silver IPPY award for her novel “Undaunted Heart: The True Story of a Southern Belle & a Yankee General.” The honor, from the Independent Book Publishers, recognized the book in the Best Regional Non-Fiction category. Melissa Booth, a jeweler from Durham, and Kimberly Kearney, a jeweler from Raleigh, received the Jerry Miller Artist award, which recognizes the best in show at Cary’s Lazy Daze Arts & Crafts festival. Deborah Mugno, education director of the Lucy Daniels Center for Early Childhood in Cary, announced that the center introduced an enhanced Child Enrichment Program, which includes developmental screenings, individualized enrichment plans and home visits from teachers. Debra Townsley, president of Peace College in Raleigh, named Valerie Hall, a retired professor of history, a professor emeritus and senior scholar. Kayte Thomas, a social work student at Meredith College in Raleigh, spoke at the International Gastroschisis Conference in Barcelona, Spain, about Avery’s Angels, an organization that supports families with children suffering from gastroschisis, a childhood birth defect. Bettie Kelley Sousa, a partner at Raleigh law firm Smith Debnam, was named president of the American Board of Certification, which administers nationwide certifications for legal specialists. Angela Allen, an attorney at Ragsdale Liggett in Raleigh, was appointed to the Women in the Profession committee for the N.C. Bar Association. Julie Seibert, owner of Healing Through Organization, an eco-organizing firm in the Triangle, announced that the company is a finalist for the 2011 Green Award for Most Eco-Friendly Organizing Service. The award is given by the National Association of Professional Organizers. Crystal Suazo, partner at Vaco Raleigh, an executive placement and consulting firm, announced that Cristen Vaughn joined as financial recruiter. Samantha Hall, who graduated from Wake Technical Community College, joined Pierce Group Benefits, an employee benefits package provider, as account executive administrative assistant. Ashley Matlock Perkinson, an attorney at Perkinson Law Firm in Raleigh, completed the Duke University Nonprofit Management Certificate program. Brenda Locker, an account executive at First Citizens Insurance Services in Raleigh, received the Certified Builders Insurance Agent designation and was honored by the Society of Certified Insurance Counselors for five years of affiliation. Ellen Crowley, vice president and investment advisor at CAPTRUST Financial Advisors in Raleigh, announced that the company will host the Raleigh on Ice gala event in February. Tonya Norwood announced the creation of her company, Modern Enhancement Salon and Day Spa, located in North Raleigh. Leah Brown, president and CEO of A10 Clinical Solutions, a clinical research and occupational health care services firm in Cary, was a guest speaker in December at the U.S. Women’s Chamber of Commerce in Raleigh and the Triangle Ladies’ Power Luncheon in Cary. April Adams, senior manager at Cherry, Bekaert & Holland, a financial and management services firm in Raleigh, was selected for the Leadership Raleigh program of the Greater Raleigh Chamber of Commerce. Cynthia O’Neal, general counsel in the office of N.C. Lt. Gov. Walter H. Dalton, received the Marshall Memorial Fellowship for 2011 by the German Marshall Fund of the United States. The program develops knowledge of political, economic and social institutions in the U.S. and Europe. Maggie Burnett, office manager for the Chapel Hill Public Works Department, received the W. Calvin Horton Service Award for exceptional contributions to the community. Kelly Ransdell, native of Fuquay-Varina and deputy director of the Preventions, Programs and Grants division of the N.C. Department of Insurance, was recognized with the Governor’s Award for Excellence for Public Service. Kay Struffolino, an advisory board member for the Parks, Recreation & Cultural Resources department of Cary, received the town’s Hometown Spirit Award. • Scheryl McDavid, a graduate of N.C. State University, joined as proofreader. • Whitney Rigsbee joined as account coordinator in the public relations department. Patty Briguglio, president of MMI Public Relations in Raleigh, announced that the company was named agency of record for The Spectacle, a luxury eyewear shop at North Hills Mall Shopping Center. Valerie Fields, CEO of V.K. Fields & Co., a public relations firm in Raleigh, announced that the company was named agency of record for Hemisphere Beverages, an international drink distributor. • The organization opened the Center for Community Leadership. The center will provide affordable meeting space for the nonprofit and business community in greater Raleigh. • Ashley Campbell, an attorney at Ragsdale Liggett, a Raleigh law firm, was named to the board of directors for the Junior League of Raleigh. Cindy Heath, principal of Five Star Staffing & Accounting Recruiters, a woman-owned employee placement firm in Raleigh, was named chair of the Greater Raleigh Chamber of Commerce roundtable program for the small-business department board. Brenda Griffin, president of Assistance League of Raleigh, announced that the organization received a $1,500 grant from the Carolina Hurricanes’ Kids ‘N Community Foundation. The grant will go toward implementing programs to help local children affected by economic hardship. Nancy McFarlane, president of MedPro Rx, a specialty pharmacy service provider in Raleigh, was named to the Women on Board steering committee for the N.C. Center for Women in Public Service. Kaye Gooch, executive vice president of programs and services for the eastern N.C. chapter of the National Multiple Sclerosis Society, announced that the group received a $6,000 Quality of Life grant from the Christopher & Dana Reeve Foundation. • Caroll Harrell, a resident of Cary, joined as full-time sales associate at the Brier Creek office. • Meredith Gilley, a graduate of N.C. State University, joined as full-time sales associate at the Youngsville office. Rebecca Russell, owner of ERA Pacesetters Realty in Cary, announced that Sharoni Rotondo, Courtney Mills and Anna Marie Wade joined the company. Laura Huntley joined Allen Tate Realtors’ Brier Creek office as sales associate. Susie Fougerousse, owner and president of Rosenberry Rooms, an online retailer and children’s furniture boutique based in Raleigh, announced that the company was featured in Oprah’s Ultimate Favorite Things 2010 episode on TV. Jeanette Falk and Becky Broun, owners of The Children’s Store in Chapel Hill’s University Mall, launched a newly renovated website for their store. The website was designed by Julie Holmes, owner of Julie Homes Design in Chapel Hill. Michele Little, owner of One Chic Mama in Raleigh, announced that the company will offer an online workshop this month called “A Brand New You.” The workshop is intended to help women rediscover and redesign their personal style. Betsy Gaskins-McClaine, vice president of heart and vascular services for WakeMed Health & Hospitals, announced that the Raleigh campus and Cary Hospital are the first in North Carolina to receive full Heart Failure Accreditation from the Society of Chest Pain Centers. Nancy Andrews, dean of the Duke University School of Medicine, announced that the National Institutes of Health and the National Institute of Allergy and Infectious Diseases have awarded the medical center more than $52 million over the next seven years. The grant will support development and implementation of programs that monitor laboratories involved in HIV/AIDS research. Betsy Casanave, director and chief of mobile critical care services for WakeMed Health & Hospitals, announced that the department received the 2010 Ground Critical Care Award of Excellence by the Association of Air Medical Services. Amy Daniels, of the Rex Healthcare Foundation, announced that the organization’s Angel Fund received a $30,000 donation from le Tour de Femme, a cycling race that raised money to fight cancer. Kerry Chandler, director of Women’s Imaging Services at Wake Radiology, announced that the Garner office received the Breast Imaging Center of Excellence award from the American College of Radiology. Denise Parks, a nurse with Hospice of Wake County, earned her certified hospice and palliative nurse certification. Ellen L. Morrison, president and owner of ELM Wellness, a Raleigh-based nutrition therapy firm, announced the opening of a second office in Franklin Square in Chapel Hill. Dr. Sara Winchester, who completed her fellowship training at Duke University Medical Center, joined Raleigh Neurology Associates in the department of child and adolescent neurology. Gina Racca, a licensed medical aesthetician, joined the staff of Dermatech Aesthetics in Raleigh. During seven of her nine years in the field, Racca worked in a dermatology office, which gave her experience in multiple skin types and conditions. Andrea Crane of Dermatech Aesthetics & Fearrington Plastic Surgery in Raleigh announced the addition of Katherine Strange, a licensed massage therapist, and Whitney Green, a medical aesthetician, to the practice. • Laura Meacham, medical aesthetician and laser technician, joined the staff. Meacham recently attended Cutera’s Clinical Forum in New York. Meacham’s previous positions were at Bliss Spa in New York and the International Dermal Institute in Chicago. • Shari Hoots, president and owner of the spa, and Alex Atwell, spa concierge, participated in Susan G. Komen’s PinkFest to celebrate and honor breast-cancer survivors in our community. Glo de Vie provided free skin-care consultations and gave away a prize package to a breast-cancer survivor. Joyce Mitchell-Antoine joined WomanCare Global, a women’s health-care nonprofit organization in Chapel Hill, as vice president of development. Victoria Tobin, an admission nurse with Hospice of Wake County, earned the certified hospice and palliative nurse certification. Melissa Troester and Liza Makowski, both assistant professors in the UNC Gillings School of Global Public Health, will be principle investigators in a study of how factors such as pregnancy and obesity can increase the chances of certain types of breast cancer in young, African American women. Dr. Karen Mohlke, associate professor of genetics in the UNC School of Medicine, co-authored a study that discovered hundreds of genes that influence human height. Joanne Jordan, a distinguished professor of medicine at UNC-Chapel Hill, led a study that evaluated the role played by genetic factors in the worsening of osteoarthritis.